By saying ‘the tree of life’, I am not talking about the premier English movie of 2011 or about the common motif in mythologies and philosophies. Tree of life is a common name of the Thuja tree, botanically known as Thuja occidentalis. This name indicates the restorative and medicinal values of this herb in addressing various illnesses. The essential oil of Thuja is extracted by steam distillation from the leaves, branchlets and wood of this tree. Thuja as a promising herb has been used prevalently in Ayurveda to treat warts, psoriasis, bronchial catarrh, uterine carcinomas, rheumatism, cystitis and certain other chronic infections of the upper respiratory system. Thuja is known to the world most popularly as an ornamental tree and has been used widely for hedges. The word ‘Thuja’ is a Greek word meaning thuo (to sacrifice) or ‘to fumigate’. The aromatic wood of this tree was initially burnt as a sacrifice to God in the ancient times. It has been a part of the traditional healing system like Traditional Chinese Medicine and Homeopathy for treating numerous illnesses naturally. Thuja occidentalis also known as Eastern White Cedar was celebrated as a powerful remedy for treating and preventing scurvy. The native Canadians used the leaves (needles) of this tree to prepare tea that has been claimed to contain 50 mg of vitamin C per 100 grams of leaves. This tea was also used as an effective remedy for treating rheumatism and menstrual pain. Thuja is also used in evidence-based phytotherapy for treating chronic and acute infections of the upper respiratory system, angina, pharyngitis and bronchitis. Indigenous to northeastern parts of North America, Thuja essential oil is claimed to be first used by the American Indians for treating insomnia, gout, cold, dandruff and eczema. The leaves were also used in preparing a decoction for treating cold, congestion, uterine carcinomas, intestinal parasites, cystitis, fever, headache and stomach pain. Thuja was listed in the US Pharmacopoeia as a diuretic to enhance urine flow and as a treatment to stimulate the functions of the uterus. It was used as incense by the ancient people. Thuja is also used in making pest repellants, shoe polish, perfumes and furniture polishes. Ayurveda means the ‘science of life’ or the ‘knowledge of life’. This incredible healing system is treating humanity for more than 5,000 years. Ayurveda is adorably called as the mother of all healing sciences just because the other popular healing practices like Siddha, Homeopathy, Unani, TCM (Traditional Chinese Medicine) are all the branches of the Ayurvedic tree. The success behind this sacred healing methodology is its intimate connection with ‘Mother Nature’. Human beings are a part of nature according to Ayurvedic philosophy and it strongly insists that a disciplined life style along with the use of herbs, essential oils, meditation, yoga and spiritual oneness is the secret behind healthy aging and longevity. Anything that makes use of natural remedies automatically falls under the Ayurvedic wing and paves way for prevention of diseases and complete well-being. Health according to Ayurvedic texts is the combination of mental, physical, emotional and spiritual wellness. It defines that every individual has a unique constitution made of three biological energies known as doshas namely vata, pitta and kapha dosha. Every one of us will have a predominance of any one of these doshas deciding our physical, mental and behavioral qualities. Perfect balance between these doshas means that a person is hale and hearty and imbalance of these doshas leads to illnesses. Ayurvedic remedies are focused towards striking an ideal balance between these doshas as these energies are responsible for controlling our metabolic functions, nervous system, lymphatic system, functions of the brain, respiratory system, excretory system and the circulatory system. Thuja herb and its essential oil are commonly used in Ayurveda for treating many diseases and is said to pacify kapha and pitta dosha and increase vata dosha. Thuja is one among the best natural remedies for treating menstrual problems. Vata dosha is responsible for the process of elimination from the body like sweat, urine, feces and menstrual fluids. As this oil aggravates vata energy, it has been proven effective in treating delayed menstruation, blocked periods and promoting regular menstruation in case of very little flow during periods. Apart from this, Thuja oil is also powerful in alleviating other symptoms of menses like severe pain in the abdomen, nausea, fatigue, cramps and loss of temper. Thuja is a popular homeopathic remedy for dealing with menstrual disorders and ovarian cysts. You can add 2 drops of Thuja oil to warm bathing water or mix 1 drop of Thuja oil with 10 drops of sesame oil and gently massage on your lower abdomen to treat menstrual pain, fatigue, nausea and restlessness. 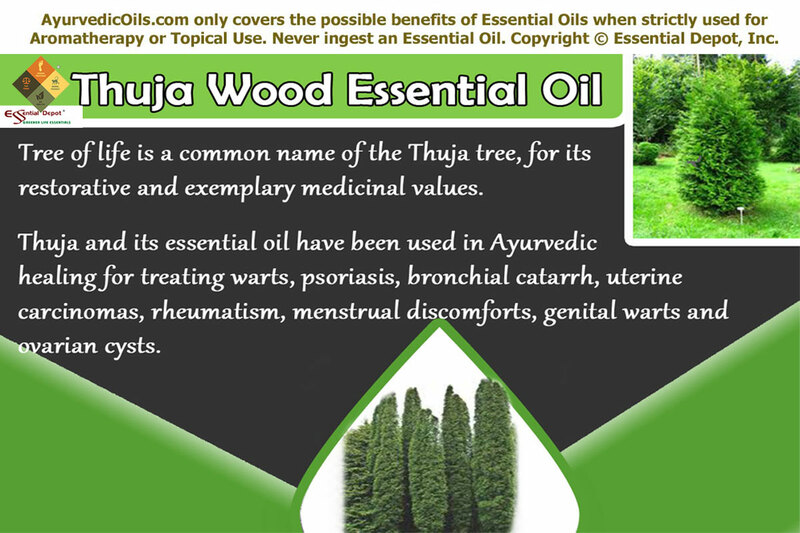 Thuja essential oil extracted from its leaves, wood and root is an excellent Ayurvedic remedy for treating warts including genital warts and venereal warts. HPV is the human pappiloma virus that is responsible for genital warts. It’s been found that there are about 1 million new HPV cases every year and about 15 to 40% of the adult population is affected by HPV in the United States. Thuja essential oil has been proved effective in treating warts by stimulating the immune system and making it defensive against viruses and in treating the existing cells that are virally affected. Notably, this herb was used externally in the form of ointment or tincture for treating venereal warts, ringworm, warts and thrush in the 19th century. Blend 2 drops of Thuja oil with 15 to 20 drops of Olive oil and apply topically on the affected areas for quick relief. This blend is commonly used in Homeopathic medicine for treating warts and it is also recommended for treating other skin problems like itching, aging spots, syphilis, distorted nails, burns, bed sores, psoriasis, eczema and vaginal infections. Excess deposits of fluids, salt, uric acid, toxins and improper blood circulation are the major causes for rheumatic pain, arthritis, inflammation and gout. Excess kapha is responsible for stagnation of water and other fluids in the body and decreased vata leads to improper blood circulation. Thuja oil works by reducing kapha and promoting vata dosha. Gently massaging 2 drops of Thuja oil mixed with 15 drops of coconut oil promotes blood circulation and helps in relieving pain, reduce inflammation and promote the elimination of salts, excess water, uric and other toxins through urine. Ayurvedic texts state that accumulation of ama or toxins in the body is the primary cause for numerous health conditions like obesity, acne, renal calculi, urinary infections, prostate problems, digestive disorders, intestinal worms, respiratory problems and heart diseases. Thuja is a promising detoxifier, astringent and diuretic that aids in eliminating the harmful toxins and other excessive deposits like salt, uric acid etc., through urine and purify the blood stream. Mix 2 to 3 drops of Thuja oil with 20 drops of sesame oil in massage or add 2 drops in hot compress or bathing water or in your vaporizer for getting rid of toxins. This oil also assists in killing bacteria and viruses responsible for many diseases. Thuja oil also acts as and expectorant and helps in relieving cold, cough, bronchitis, chronic sinusitis, asthma and other respiratory problems due to congestive heart failure. Add 2 drops of Thuja oil in steam inhalation and gently rub your chest, neck and back with 2 drops of this oil blended with 15 drops of warm coconut oil for good relief from respiratory problems. Thuja acts as a tonic to the entire system by stimulating the functions of digestive system, excretory system, nervous system and endocrinal system. It promotes the secretion of gastric juices, bile, hormones and other enzymes in the body. This oil also aids in regenerating the growth of red blood cells and white blood cells that are responsible for the body’s immune power. Thuja essential oil has a strong and appealing aroma, when added (2 drops) to your burner, diffuser or vaporizer during meditation, prayer, exercise or your leisure time can make your body resistant to diseases and your mind against stress and worries. 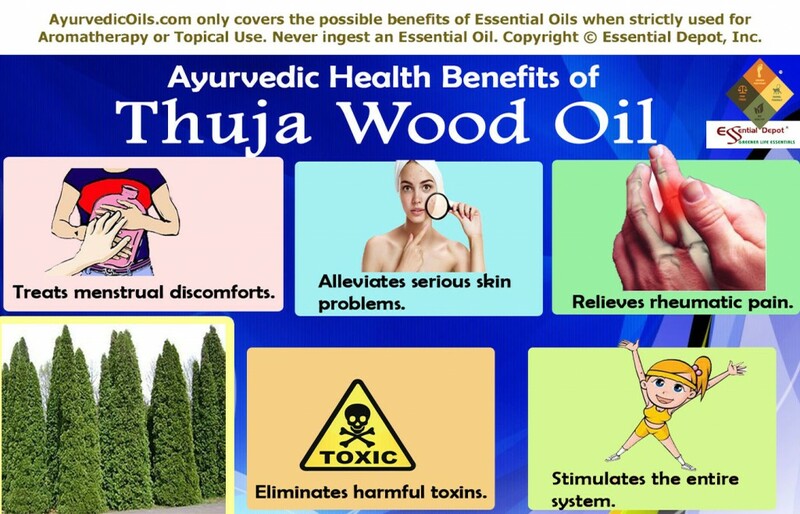 Other uses: Apart from these health benefits, Thuja essential oil is also used in making perfumes, cold rubs, soaps, cosmetics, cologne, insect repellants, household cleaners, cold rubs and toiletries. Disclaimer: Never take essential oils internally. Remember to dilute essential oils before external use as pure and organic essential oils are highly concentrated liquids. Thuja essential oil is an abortifacient and it should not be used by pregnant women and nursing mothers. Always consult your Ayurvedic physician before using suitable essential oils for your unique health condition and individual constitution. This is only for the purpose of information and is not meant to diagnose or replace any prescribed medication or medical supervision. This entry was posted in Essential Oils - Learn About and Purchase and tagged Ayurvedic health benefits of Thuja essential oil, Ayurvedic oils for arthritis, Ayurvedic oils for dysmennorhea, Ayurvedic oils for menstrual pain, Ayurvedic oils for sinusitis, Ayurvedic oils for urinary problems, Ayurvedic oils for warts, Ayurvedic remedies for delayed menstruation, Ayurvedic remedies for immune power, Ayurvedic remedies for respiratory problems, Ayurvedic remedies for rheumatism, Chemical constituents of Thuja oil, Health benefits of Thuja essential oil, Therapeutic properties of Thuja oil, Thuja in Ayurveda, Thuja occidentalis, Thuja oil by AyurvedicOils. Bookmark the permalink.